On the 7th of November, one day after the midterm elections, I left Tempe and drove to Quartzsite , AZ. and purchased an LTVA season pass. Even though I usually move around southern Arizona in the winter, I still like to buy the season pass for the Long Term Visitors Area. That way I have a home base so to speak. Not as pretty as forest but nice sunshine. Quartzsite is not awfully busy yet. 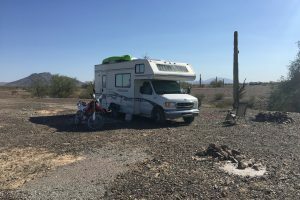 The biggest migration of RV dwellers wait till after the holidays to descend here, consequently causing the population of the town and surrounding desert to swell to many times it’s normal size. I rode into town today and only a handful of booths were open. When the Big Tent Show is in swing, and rows of shops selling their wares are open and after your money, it is hard to find a parking spot within a quarter-mile of the main drag. The temperature has been almost perfect. This next week is forecast to be in the mid 70’s everyday. The one thing that’s not pleasing in the open desert is wind and today is one of those days. You never want to leave for the day and forget to take down your awning. Wind can come up very quickly and rip away anything it can get a hold of. I parked in the same place I did last year. It is across the wash from the nudist area. I like it because it is isolated from other campers. Other campers keep away for fear they will see something shocking. Yeah I see… Last night I was setting up camp and there he comes…. walking down through the wash wearing nothing but a sombrero! I yelled, “Don’t look Ethel!” but it was too late. She’d already seen a desert bush. You’re going to have to explain that last paragraph to me. I must be dense. I guess I’d better explain my last joke for those of you too young to remember the 70’s craze of “streaking”. This is in reference to a Ray Stevens song The Streak. I knew exactly who Ethel was. That was a funny song. No blog about your new car? Maybe after you can show a picture of it attached? Right Daryl. I always feel like I’m going to jinx something by “counting my chickens” so to speak.